If your cat loves bags, then here is something just for your feline friend. It’s called For Cat’s Sake and they call it a “luxurious paper bag” (I never knew that paper bags could be luxurious). 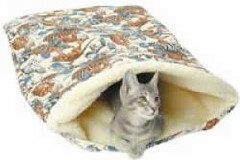 There is shearling inside and the “crackle” liner will keep your cat busy for hours. You can even machine wash the paper bag (just in case of accidents). For $26.88, that is definitely a luxurious paper bag. This entry was posted on Saturday, June 9th, 2007 at 3:54 am	and is filed under Cats, National Dog, Cat & Pet Info, Products & Services for Cats & Dogs. You can follow any responses to this entry through the RSS 2.0 feed. Both comments and pings are currently closed. So, is there a multiple discount available (3 kitties can’t share the same bag). I’ve checked those out. I know my cats would love one but they’re too small for my one big guy.